Explanation: How do you calibrate a huge gravitational lens? In this case the lens is the galaxy cluster Abell 383, a massive conglomeration of galaxies, hot gas, and dark matter that lies about 2.5 billion light years away (redshift z=0.187). What needs calibrating is the mass of the cluster, in particular the amount and distribution of dark matter. A new calibration technique has been tested recently that consists of waiting for supernovas of a very specific type to occur behind a galaxy cluster, and then figuring out how much the cluster must have magnified these supernovas through gravitational lensing. This technique complements other measures including computing the dark matter needed to contain internal galaxy motions, to confine cluster hot gas, and to create the gravitational lens image distortions. 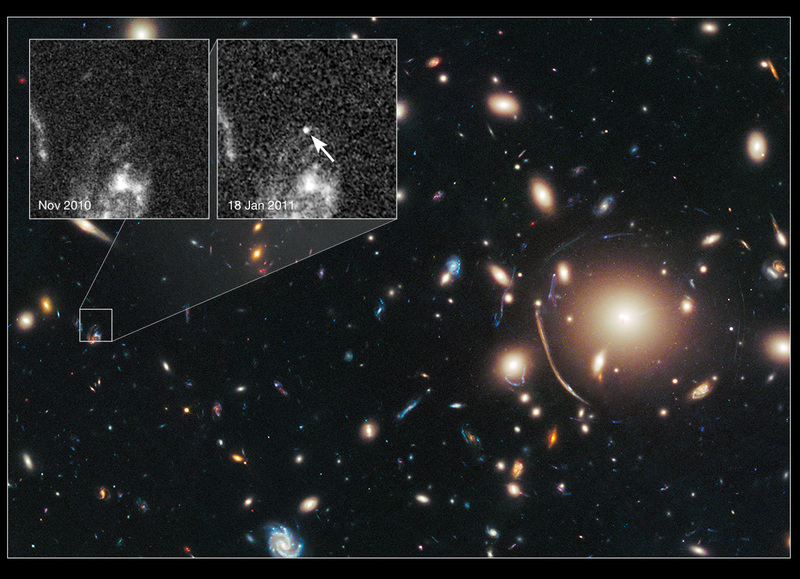 Pictured above from the Hubble Space Telescope, galaxy cluster A383 shows its gravitational lens capabilities on the right by highly distorting background galaxies behind the cluster center. 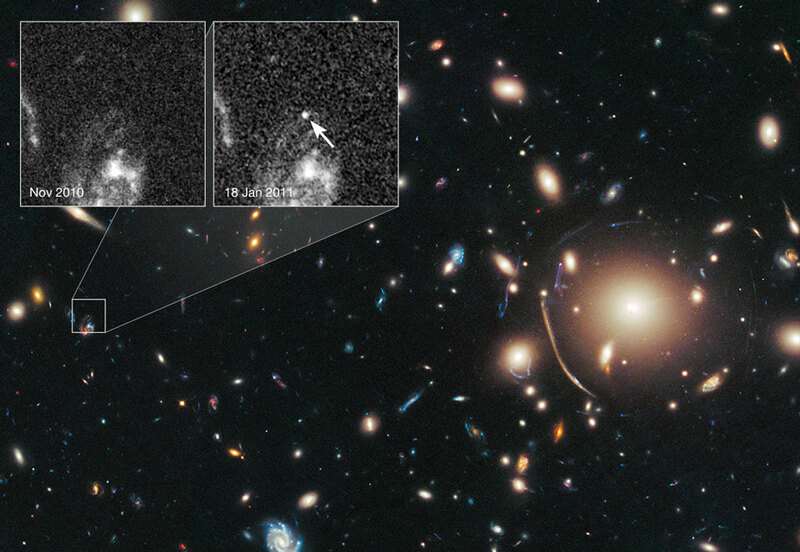 On the left is a distant galaxy shown both before and after a recent revealing supernova. To date, calibration-quality supernovas of Type Ia have been found behind two other galaxy clusters by the Cluster Lensing And Supernova survey with Hubble (CLASH) project.